Atari 2600 - used to play asteroids and centipede a LOT. Then it was onto the glorious Sega Master System. i never actually owned the Mega Drive/Genesis. After that it was the Amiga, on which I really got into the Monkey Island games and subsequently every point & click I could find. Sony Playstation after that along with the PS 2 afterwards, this the age I really miss. i was also part of the PC master race during the Playstation era, also where I discovered I love my RPGs. Such as the oldschool Bioware games (long before EA ate them), Planescape Torment, Baldur's Gate etc. Along with the old SSI stuff, Eye of the Beholder etc. Then the Xbroke 360 came along, though mercifully I only had the two crap out on me. Still have the last one now. Just came out the military at that point so needed something to do. Turns out I despise modern gaming, so I sold the PS4 and Xbone nearly as fast as I bought them. Nowadays I play a few mobile games and effectively nothing after 2012/2013 on this here laptop. Last new game I bought was MGS V on 360. Emulate some stuff as well. Played SWTOR too and still very occasionally Star Trek Online but those are horrendous grind fests much like this game is, but you have to spend more time on them so I lost interest. Never actually played any text based adventure stuff though in my illustrious time wasting history. EDIT: I neglected to mention I also owned every iteration of Gameboy up to but not including the 3DS, due to me being garbage at platformers I only ever played Super Marioland and Warioland as my only Mario games ever. Obviously played Pokemon to death and Zelda. That'll keep me busy for a bit while I figure out the syntax etc. Be just like using DOS again! You were eaten by a lurking grue. Never figured out that game. My lineage is quite lengthy. I'll try to keep it brief. Sort of chronological. Atari 2600: pitfall, star wars, tanks? Various others. Master system: outrun. Some space platformer. Wrestling. Basketball. Spy Hunter? Genesis: sonic 1-knuckles. Nba jam. Thunder strike. Super baseball 2020. Street fighter 2. Ps1: Basically every game that was worth anything. I earned money cleaning the house, had nothing else I wanted so I bought a ton of games. Metal gear and final fantasy obvious highlights. N64: all the best Nintendo games. Pc: civilization. Wing commander. Worms 2 (or 3?). Rainbow 6 (first online game). Half life-tfc-cs. Starcraft, warcraft. EQ, WoW. HL2. Fallout 1-2 (yeah I played the new ones too), dota (wc3). not going to list new games as that's boring. Ps2: all the good stuff. I'll mention suikoden 3 just because. Wii, wii u, switch: same as gc. Ps3-ps4. Spending tapered off here. Tried to hit the highlights. I played the key Xbox games at friends, and caught up on the good nes games later. Played a ton of dream cast at a friend's. Some Saturn, jaguar. If it's decent I've probably played it or know all about it. This is the first and only game I’ve ever played. And no, I’m not 6. I've been pretty purist in my interests: must be Star Wars or have elves. PC: Warcraft II, TIE Fighter, Shadows of the Empire, Rogue Squadron, Phantom Menace (SO MANY HOURS WASTED JUMPING AROUND ON FLOATING RINGS), Warcraft III, DOTA. And I guess there was some Roller Coaster Tycoon thrown in there somewhere. And now KOTOR, because I missed that somewhere along the way. XBox: some DS/LS RPG thing that was definitely NOT KOTOR but I don't remember what it was, the LOTR series... and Forza, because my boyfriend liked fast cars. Mobile: a couple of time-wasters, a couple of city-building games, and now this. Started on the Atari 2600 myself. Asteroids was the game of choice. Star Raiders was good back in the day as well. After the 2600 moved onto the Commodore Pet and then the Commodore 64. (We didn't have a Nintendo). Next big game system was Sega Genesis. Would rent games from the local video store to save cash (also to test out which games were worth buying). After that, took the XBox route. Though if I had a time machine I'd go back and go Playstation instead. Too many updates and the like. Loved PC games. Played KOTOR and KOTOR 2. Though I wasn't too fond of KOTOR 2. Always felt to me like they looked at the complaints/issues from the first game and tried to make EVERYBODY happy instead of making a good game. KOTOR 2 also felt unfinished to me. However, having said that I "did" enjoy playing it. Just wished it was a little... more. GoG does indeed have all the TIE games. X-wing vs. TIE fighter is a classic. I'd get them but I keep neglecting to buy a joystick, which you need. Won't work with a controller unless you have a lot of patience with xpadder or something. Only played Shadows a few times but it and I did not get along. I actually tried Phantom Menace via emulator, didn't make it very far. Sounds like that platforming bit would have sent me into a rage spiral. I also recall the game hint/phone support things to. Dial-a-cheat was all the rage alongside the magazines. Still have some old Amiga mags lying around, nice to look back at what was a promising and blooming industry. Before stuff happened.....I hate stuff, it ruins everything. Colecovision, Atari 2600 - Combat, Asteroids, Defender, Kaboom, Chopper Command, Missile Command, and numerous others. Nintendo - Contra, Shadowgate, Golgo 13, Tecmo Bowl, Mario of course. Sega Genesis, Short lived, nothing stands out. Super Nintendo - Turn and Burn, Ken Griffey JR Baseball, others. Sega Saturn - Sega Rally Championship, Firestorm, PlayStation - X Com, Mortal Kombat, Killer Instinct, PS2 nothing memorable, Nintendo 64 Goldeneye 007, Xbox 360, Call of Duty, Marvel Alliance, Turok, ****-Butcher Bay, PS4 - Witcher 3, GTA V, Madden, NBA2k, Destiny, Shadows of Mordor, AC Origins, Farley 5, and soon Anthem. PC - Leisure Suit Larry, Mechwarrior, Everquest, Earth and Beyond, City of Heroes, World of Warcraft, Star Trek Online, Both Kotors, SWTOR, World of Tanks and Warships. Mobile - Last World War Z, and now this. Wish I had all the time and money I’ve spent but gaming has always kept me out of trouble. Same, except I’ve played a couple other mobile games like angry birds and stuff. Do card games or board games count? If it's only electronic, then I spent a lot of time in MUD(Multi User Dungeon), then subsequently the most time in WOW. I have 6 knocking around, even an old speaker setup and CRT monitor. You can feel the radiation melting your eyes off it still. I have an OG 500, a 500+, two Amiga 600s and two 1200s. I have a Pong machine as well. I always gifted, traded or sold my old equipment. Wish I hadn't. I did that with my older consoles. I also wish I hadn't. Something about sprites adds to games for me. Emulating just isn't quite the same. Oh wow, that's awesome! I just found a walkthrough. There was one jump that was still pretty tricky and you had to get it perfect or Obi-Wan would fall into the abyss... Definitely when I learned just how important "Save Game" was. SPACE QUEST!!!!! I'd forgotten all about the adventures of Roger Wilco. 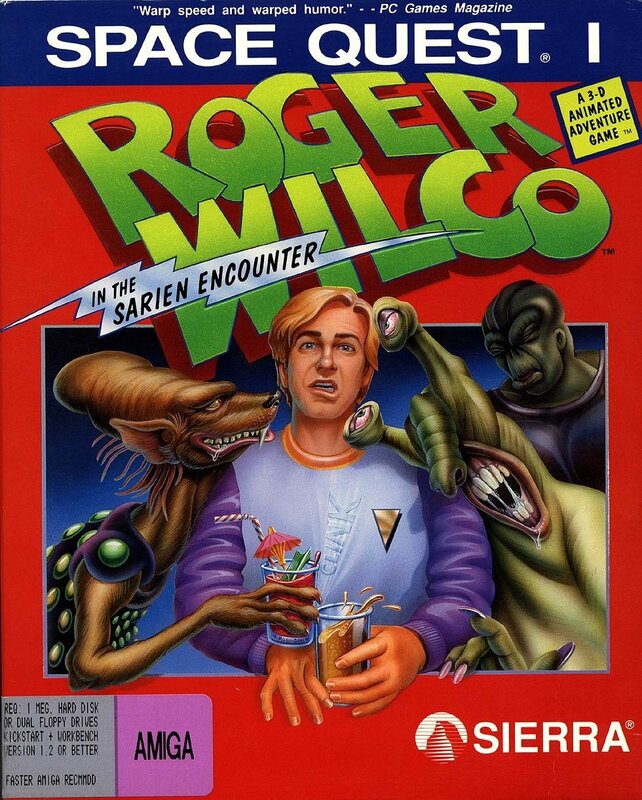 Such an amazing game In answer to your question; that was probably where I started playing Space quest on my Dad's PC. I still mainly play RPG's on console these days but most of my gaming time actually goes on tabletop games like X-Wing miniatures these days. In one of the SQ games there is a huge spider chasing you. We were supposed to roll the rock down the slope below a rock bridge to kill it. I moved it to the center of the bridge and pushed it off, and killed it. A message came across the screen saying "Wow, you did something we didn't think anyone would do. Extra points etc.."